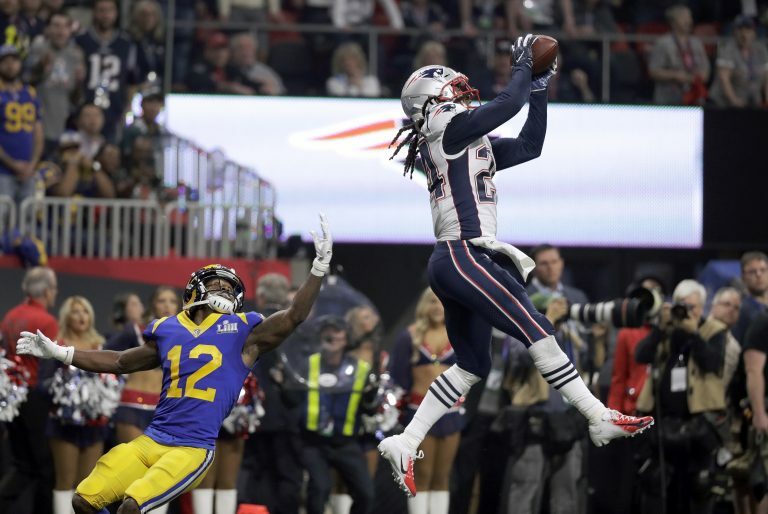 Stephon Gilmore on late INT: "one of the easiest picks I've had all year"
There weren't many times in Super Bowl LIII where the Rams found themselves in scoring position. With just over four minutes left in the fourth quarter and the Patriots up 10-3, the Rams were closing in on the red zone for the first time in the game, looking to tie it. That's when Stephon Gilmore stepped up. With pressure coming from a corner blitz, Jared Goff launched a pass down the right sideline intended for Brandin Cooks. The former Patriots receiver just barely overran the route and Gilmore leaped into the air to secure the pick, giving the Patriots the ball back with a chance to put the game on ice. And if you ask Gilmore, he knew it was coming. The first-team All Pro selection said he knew he'd be matched up against Cooks and played him well. He said he also knew, based on watching film, that Goff would take a couple shots towards the end zone if given the chance. “You got to know the situation, know the quarterback, know who you’re playing against and play accordingly,” he said.